The number of planets in our Solar System has always been a polemic issue; Even now astronomers don’t reach an agreement on this topic. Another problem is that astronomers have named the planets with strange names like Quaoar, 2003 UB313, Xena and many other names that are quite confusing because these names don’t represent their position. To avoid this confusion, the Masters of Light have proposed an easier numeric system of the planets which is used by other extraterrestrial civilizations. 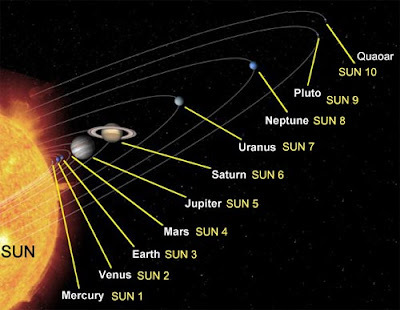 For example, in this system, Venus would be called Sun 2, the Earth would be called Sun 3, Mars would be Sun 4, and Pluto would be called Sun 9. We hope that one day astronomers will use this system to avoid more confusion in the future discovery of exoplanets. Interlocutor: Another of the topics that I have to ask you is related to how many planets are there in our Solar System. Ruanel: There are eleven planets. Interlocutor: I understood that they were twelve. Ruanel: I confirm you that they are eleven, two of them beyond Pluto. We are speaking about important planets, because in fact there are 15 or 16 celestial bodies, but of the size of asteroids, and they cannot be considered planets. Interlocutor: Are some of them inhabited? Ruanel: No, beyond Pluto not. The inhabited planets are very few. Interlocutor: Another question now that I remember it. Did the Sumerians have advances because they had contact with extraterrestrials? Interlocutor: Did they have contact with some reptilian race of extraterrestrials? Ruanel: No, with regard to Sumerians, no. But I don't discard the existence of other planets outside of our solar system inhabited by reptilian races, like the race that existed here on Earth in the prehistory  that have come here and contacted with some towns. Interlocutor: Do you mean something like the velociraptors that had the size of a human being more or less, I believe that 1,80 m.[6 feet] or something more? Interlocutor: Were they animals or humanoids? Ruanel: They were predator animals. But remember that intelligent predators can exist. If races of intelligent insects exist, like the Langar, why would not be also intelligent reptilians or amphibians? There are worlds where vegetable intelligent life has been developed with the help of chlorophyll. It would be absurd to deny it. We know that there are carbon beings like all of you and that there are also silicon beings. Interlocutor: Then, with regard to Sumerians isn’t there anything else to say? They received extraterrestrial influence and their gods were nothing more than those aliens that influenced in their civilization? Ruanel: Correct. The topic is like that. Interlocutor: Okay. The next question is related to an astronomical discovery that was made recently on a celestial body at 1.6 billion kilometers from Pluto. This celestial body that is incorporated to the stellar chart, measures 1285 kilometers of diameter, ten times less than the diameter of the Earth. With the half of Pluto's size, it orbits the Sun every 288 years at a distance of 6.4 billion kilometers. This astronomical discovery was baptized as Quaoar, in homage to a creative force of the indigenous mythology of the South of California. The scientists that presented the discovery in the Astronomical Society of the United States explained that Quaoar is in the so called Kuiper Belt, a cloud of objects made of ice and rock that orbits the Sun beyond Pluto. The object was detected by the scientist Mike Brown, of the California Institute of technology who assured that Quaoar doesn't deserve to be called planet because it is very small. Although, its behavior as a planet is better than Pluto. Pluto's orbit has an inclination of 17 degrees, and at a certain distance of its trajectory it approaches enough to the sun so that the substances on its surface are warmed, for that reason it reflects more light. On the other hand, the orbit of Quaoar has a 7-degree inclination, and it is neatly regular. Mike Brown and the expert Chadwick Trujillo discovered the celestial body through a telescope in Palomar Observatory near San Diego. When tracking the files, they found that the object had already been photographed in 1982 without being noticed. I have extracted this information from the Clarin newspaper October 8, 2002. My question is: Is this the discovery of the tenth planet you already told us? Ruanel: It is the tenth planet, but the scientists have given to the discovery a minuscule importance... For many thousands of years mankind had in its astronomical charts only seven planets. Later on Neptune was discovered, and less than a century ago, Pluto, and now that the tenth planet is finally discovered, the one that the false prophets used to call it Chiron, and they don't give to it the duly importance. Ruanel: No, it is not inhabited. Interlocutor: Can it be inhabited the future?